Some surprises this week: “Monday Morning Quarterback” is “Sunday Morning Quarterback,” for one week only. I felt news of Muhammad Ali’s death, on Friday at age 74, was so riveting and important that we should publish a day early this week. My thanks to editors Dom Bonvissuto and Mark Mravic for hustling Saturday night and early Sunday morning to get the piece up on The MMQB. Except for “Ten Things I Think I Think,” the column will be solely about the impact of the life of Ali. This is more about his importance to our society than anything else, but we’ll all be okay if we go a week without football dominating this column in June. I did not know Muhammad Ali, at all. I never met him. And this is a football column. Why, then, write about someone I did not know, who had nothing material to do with football? I have a roundabout way of answering that. First, let me say that if you’re younger than 45, most if not all of what you know about Ali will be from stories you’ve read or heard, or TV pieces you’ve seen. You wouldn’t have good personal knowledge of how the man impacted the lives of millions of Americans and people around the world. And I’m going to start there. I grew up one of four children to an ironworker and stay-at-home mom in a town in northern Connecticut, Enfield, that was a pretty conservative place. When Ali the showman and political figure began emerging in the boxing rings and television programs and courtrooms of America between 1963 and 1967, his bombast was not popular. No athlete, black or white, was as audacious and outspoken as Ali, and no one talked a tenth of the trash he did. Most of America didn’t like it. Boxing was much bigger then than it is today, and Ali (known as Cassius Clay until joining the Nation of Islam in 1964) was a burgeoning star. Muhammad Ali, photographed in 1970. I was about to turn 10 when Ali refused induction into the military in April 1967, and he became in most quarters of America (particularly white America) an enemy of the state. The governor of Maine said Ali “should be held in utter contempt by every patriotic American.” No one at the time took his self-identification as a “conscientious objector” to the Vietnam War very seriously, and he was convicted of draft evasion that June. His heavyweight title was stripped. Life went on. For three years and six months he was banned from boxing—the prime years of his career, starting at 25 and lasting till he was nearly 29. That’s how strongly he felt about not going to Vietnam and fighting in a war he felt America had no business being in. Not that he’d have gone to any war. He claimed his religion prevented him from fighting in wars, except those directed by Allah. 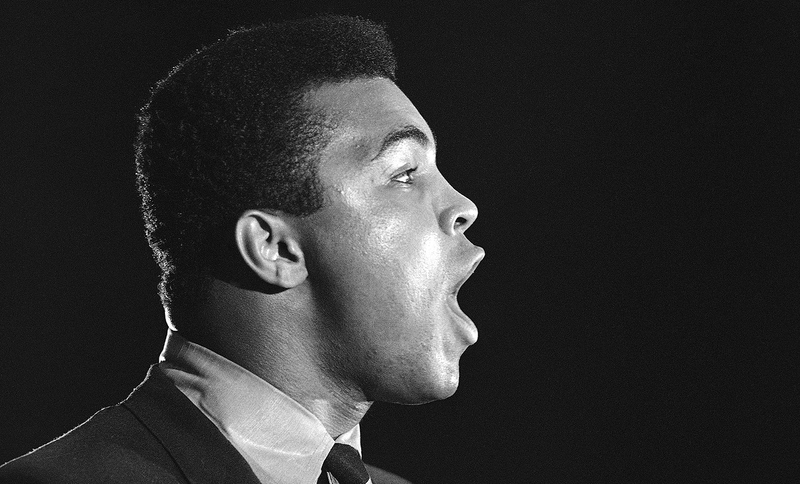 Ali was the headliner in an America roiling with controversy over an unpopular war. That controversy divided thousands of families. I’m not saying Ali’s decision to become a conscientious objector was significant to my brother Ken doing the same, because he never told me. But while a student at William & Mary from 1967 to ’71, Ken took the anti-war side, vehemently. He protested. He was the first member of the King family to attend college of any kind, so it was a big deal when his graduation drew near in the spring of 1971. The family piled into the station wagon (a very Griswoldian trip) for the nine-hour drive to Williamsburg for the ceremony. 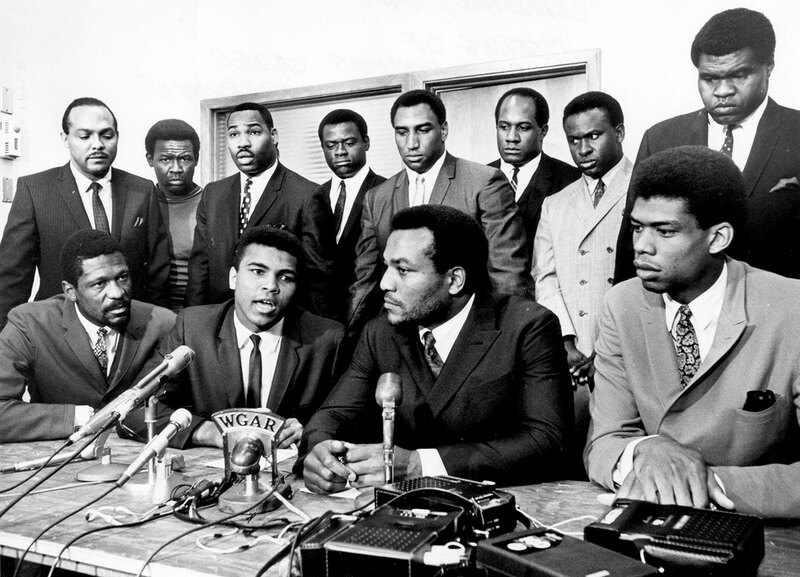 In 1967, Bill Russell, Jim Brown, Kareem Abdul-Jabbar (then Lew Alcindor) and other prominent black athletes gathered to support for Ali’s refusal to fight in Vietnam. When we got there, Ken informed us he’d donated the $35 for the cap and gown and graduation fees to an anti-war cause, and he and a few friends would be marching in the ceremony in white shirts with black armbands, to protest the war. Let’s just say my father, veteran of the Seabees in the Korean War, was not pleased, and the weekend was testy, not celebratory. But Ken was certainly on the right side of history. Ali was certainly on the right side of history, and a beacon for it. Had Ken gotten his draft notice, he made it clear that he would not report. At 13, I wasn’t entirely certain what that meant; all I knew was it was a rough time in the family, and it took some time for my father and Ken to see eye to eye after that. But that’s what our country was like at the time: fathers against sons, sons against the war, some sons reporting for duty in a burst of patriotism, some sons against the war getting drafted into it anyway. If you paid attention to the news on Saturday, you heard how reviled Ali was in some quarters during this time. But it’s often not a popular thing to risk your job, and your livelihood, for a principle. Four decades later, there was Ali, having the Presidential Medal of Freedom draped around his neck by President George W. Bush in the White House, praised for standing up for what he believed was right. Now there’s something that would have shocked the world in 1967. So … now for what this means 50 years later. Suppose I asked you, “Which NFL players of recent vintage seem to have a piece of Muhammad Ali in them?” What would you say? 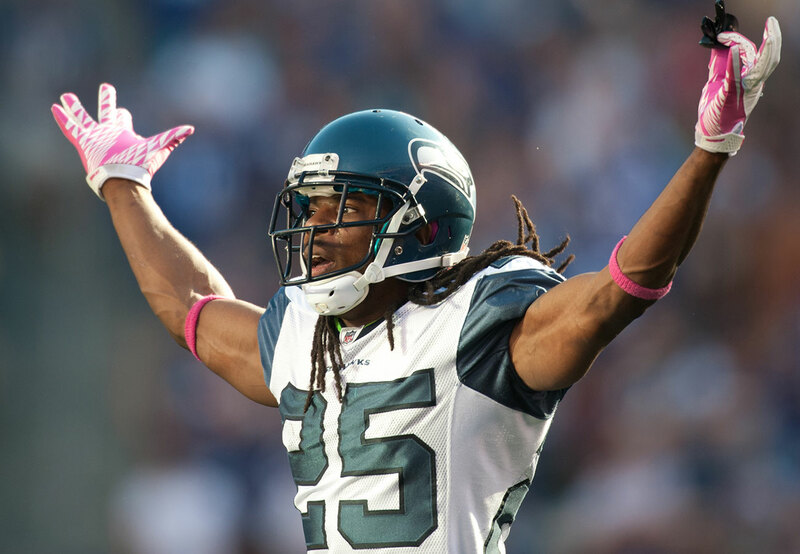 The first name on my tongue: Richard Sherman. “I have been influenced incredibly by Ali,” Sherman, the Seahawks’ All-Pro cornerback, said by phone from Seattle on Saturday. “Incredibly. All I did as a kid was look for stories on Ali, and learn as much as I could about him. I feel what he did. I am impacted by it. My approach to adversity and circumstances as a player and dealing with adversity … it’s so much influenced by him. 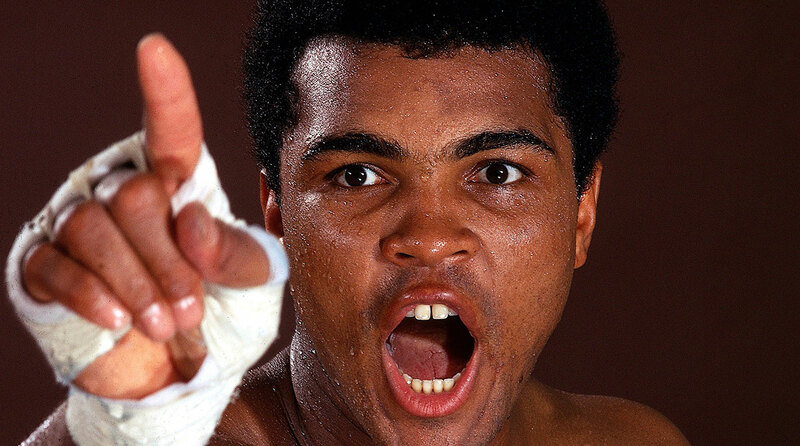 Richard Sherman draws his inspiration, and his on-field style, from Ali. That’s because Terrell wouldn’t call his foe Muhammad Ali; he would only call him Cassius Clay, a form of derision (Ali felt) that was mystifying and demeaning. So Jack Harbaugh, on the weekend of the 2012 opener for the Ravens, joined Ali and wife Lonnie at a Ravens practice, and Jack told the team the story, Ali sitting in the background nodding and appreciating the story. Afterward, the players gave Ali a standing ovation. The visit was recorded by the Ravens, and pulled from the files after Ali’s death, for all to see. Harbaugh felt the way I did … not really able to put into words why Ali was the most significant athlete of the last 75 years—but just knowing he was. The thing I found amazing about the life of Ali: In the span of 50 years, he went from villain to saint. And not just in the perception of what he did about Vietnam and civil rights. How about the $100 million he helped raise to fight the malady that ravaged him for the past 35 years, Parkinson’s disease? His tremors have been evident for years. But he never hid. He partnered with medical authorities fighting the neurological disorder the way Steve Gleason is fighting ALS, the way Magic Johnson fought AIDS, the way Boomer Esiason is fighting cystic fibrosis. I disagree with Sherman that there’s no forgiveness in the age of Twitter trolldom. It might be harder, but it can happen. Ali is proof of that. 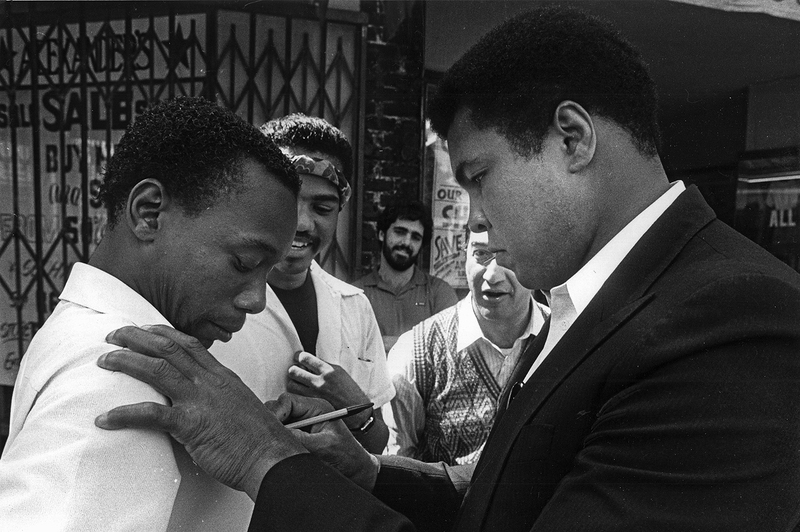 What an incredible life Ali led, and how fortunate we’ve been to share in it. I don’t usually do this, spreading the word on a video. But good friend Brian Hyland sent it along to me, and it’s perfect for this occasion. It’s a bit over seven minutes long, the 24-year-old Ali in his 27th professional fight, creaming Cleveland Williams in Houston in 1966 with a combination of harder jabs than they look and the kind of brilliant footwork that was his calling card. If you’ve got seven minutes, this will teach you everything you need to know about Ali in the ring. —Ali, as quoted by Sports Illustrated’s Jack Olsen on April 11, 1966, in a story explaining why the fighter refused to enter the armed forces and be shipped off to fight in Vietnam. —Ali, before facing Briton Henry Cooper in 1963 in London. The fight ended, in Ali’s favor, with a TKO in the fifth round. —Longtime Ali chronicler Jerry Izenberg, formerly of the Newark Star Ledger, recalling the Holmes-Ali fight in October 1980, the second-to-last bout of Ali’s career, after which Holmes cried because he felt terrible about punishing a clearly diminished Ali. —NFL Players Association executive director DeMaurice Smith, in a statement issued Saturday. —Kareem Abdul-Jabbar, in remarks on Facebook. —Ali, to TV host Steve Allen in 1963. —Ali, on the same show with Allen. —Ali, screaming at Sonny Liston in a 1965 fight, with Liston laying on the canvas after being knocked there in the first round by Ali. —Ali, to biographer Thomas Hauser, via Sports Illustrated, after the fighter retired in 1981. Times have changed in the fight game. Average time between bouts in Muhammad Ali’s first 29 fights (before his suspension in 1967 for refusing military service): 80.5 days. Average time between bouts in Floyd Mayweather’s 49-fight career: 134.7 days. Muhammad Ali’s former training camp in Deer Lake, Pa., became a country inn called the Butterfly & Bee Bed and Breakfast. According to its website, the property is now for sale. In the early sixties, as a student (and an amateur boxer) at the University of Miami, future Eagles and Jets head coach Rich Kotite became one of Muhammad Ali’s sparring partners. 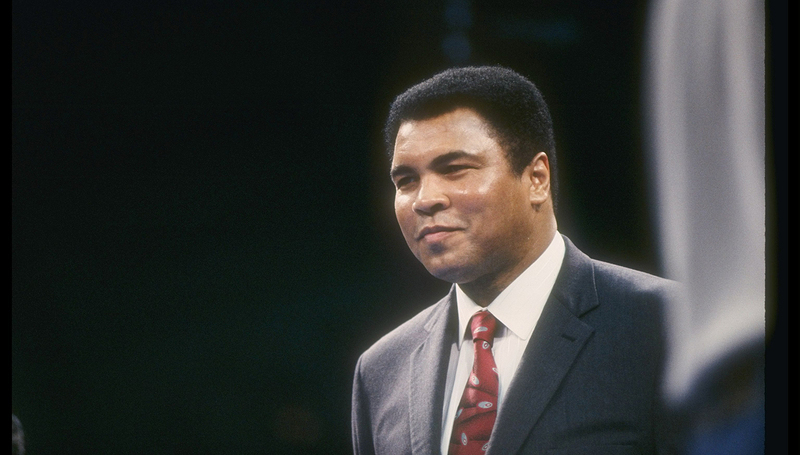 Christine Rosa, the former vice president of event marketing and talent relations for Sports Illustrated, met Muhammad Ali at SI’s 40th anniversary party in 1994. She knew Ali and his family so well that she was one of 350 people invited to his 70th birthday party in Louisville. She’s known him for more than 20 years. I asked her about working with him over the years, even as his disease progressed, and he would come to New York or go other places for events for SI. “He would fly coach,’’ Rosa said. “He never requested to fly private and was fine flying coach. He was never a prima donna with me. Never. And when he would come to New York, we’d put him up at a nice hotel—the Pierre I remember one time, and the Mandarin another time. Often, she’d see him performing magic tricks for people, and he’d light up when entertaining them. Ali’s wife, Lonnie, requested every SI/Ali cover for the family home in Louisville—and the framed covers now line the walls there. LeBron watched the Thrilla in Manila last night. If there were no Muhammad Ali...Howard Cosell probably would have spent his entire career as a local NYC radio broadcaster. 2. I think the NFL was short-sighted not to pass the sideline-video protocol. There’s no reason teams and players shouldn’t have the capability to see video of plays that just happened. 4. I think the Ryan Fitzpatrick solution is pretty simple: one year, $12 million, with (if necessary for cap purposes) a phony second year lessening the 2016 cap hit. 5. I think the Allen Hurns extension in Jacksonville (four years, $40 million) seems a little pricey for a guy who’s had one good season to this point (2015: 64 catches, 1,031 yards, 10 touchdowns). But I get where GM Dave Caldwell’s coming from. Draft/sign undrafted free-agents, develop them, have them buy in to what you’re doing, and reward them as core players. Hurns hasn’t earned that kind of money yet, but the Jags think it’s a matter of time. 6. I think it’s good to see Richie Incognito realistic (at least when in interview mode) about his public persona and the eyes that will be on him for as long as he plays football. Don Banks of SI.com got some good stuff out of the once-troubled Incognito, like this: “Some people won’t get past 2013 when it comes to me. That’ll be in their head forever and there’s nothing I can do to change that. I can only control what I do from here on out, and that is show up each day, work hard, and be a good person and a good teammate.” He played exactly that way in 2015 in Buffalo, and now it’s about continuing to do what’s right, year after year. If he does, Incognito’s going to have three or four rich years left. 7. I think I can’t get too fired up about the news that the Pro Bowl is moving from Hawaii to Orlando. I get that people are watching it, for some reason. But what I don’t get is why the players want so much for it to continue. 8. I think there’s a cost of making deals with guys who’ve had significant off-field problems, and the Cowboys are continuing to see it. Middle linebacker Rolando McClain—sometimes very good, sometimes not—is not attending voluntary workouts. Not the best idea for a marginal player who wouldn’t be marginal if he was as dedicated as he should be, on a defense that really needs impact players, for a team that expects Jaylon Smith to beat out McClain when Smith is healthy enough to play. 9. I think this qualifies as the greatest ejection from a health club of all time: A Planet Fitness employee kicked former Giants punter Steve Weatherford out for excessive grunting. a. Finally saw a couple of good movies: Black Mass, the Johnny Depp-as-Whitey Bulger mobfest; and Bridge of Spies, the Tom Hanks hero job. Depp was pretty convincing/disturbing. I like Hanks in just about everything, and he was convincing as an attorney middle-man in the middle of a Cold War trade of spies. b. It’s like every game of the Stanley Cup finals is scripted to end suddenly for both sides and heartbreakingly for one side. It’s been great, physical hockey. c. Price versus Bumgarner this week in San Francisco. If only Price were pitching like David Price. d. What got into Mookie Betts? Yikes. e. RBIs: Betts 45 (from the leadoff spot), Adrian Beltre 40, Anthony Rizzo 40, Nelson Cruz 38, Yoenis Cespedes 37, Bryce Harper 34, Miguel Cabrera 33.
f. Coffeenerdness: I do enjoy the friendliness of Costa Coffee shops in England (I ducked over there for four days last week to visit my sister-in-law and family), but they do need to get a little more bite in their espresso. A little mild for me. g. Beernerdness: While I’m on the subject of things in England I would fix, let’s talk about lukewarm beer. Doesn’t get the job done, mates. h. As far as everything else about England, I’m a fan. I love the way of life, I love the emphasis on walking, I love the emphasis on families doing stuff together. i. Running update: I stink. I am lengthening my once a week long ones (six miles last Sunday in England, 7.3 miles Saturday in Central Park), but my times are awful, and the painful left IT-band and glute strain is making the first two miles of runs grimacing affairs. But I get ‘em done. j. Thanks to Jenny Vrentas for filling in for me last week. Much of the next six weeks (either four or five Mondays) will be fill-in MMQBers, and I’ll keep you posted about them on Twitter. I’ve got Geoff Schwartz of the Lions and Benjamin Watson of the Ravens committed to do two of the columns, and I’ll let you know about the others as they happen.